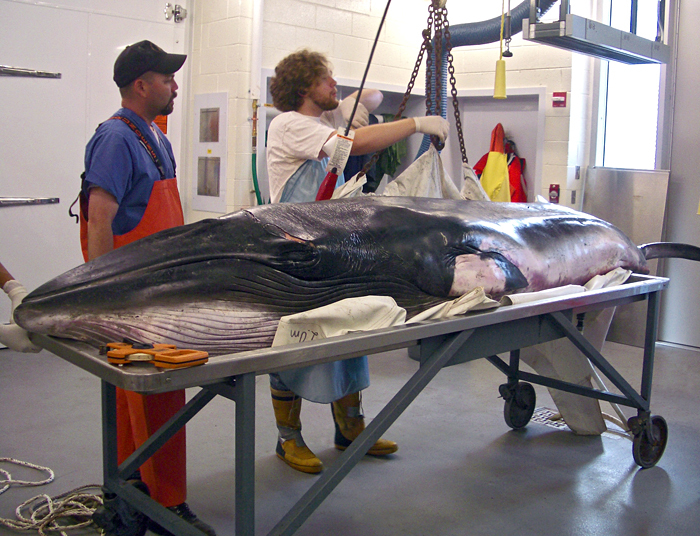 A minke whale that died and stranded on a beach is received at WHOI's Marine Mammal Center , where research assistant Scott Cramer (left) and former WHOI employee Ben Carr (now a graduate student at Boston University) use a rail and lift system to transport the carcass to the Computerized Scanning and Imaging Facility for a CT scan and then to the Necropsy Facility for dissection. MIT/WHOI Joint Program graduate student Maya Yamato conducted the first successful study of intact baleen whale head anatomy with advanced imaging techniques. She showed hat baleen whales, like this minke whale, have fats associated with their mandibles (jaws) that help convey sound waves from the ocean to ears inside their heads.